Even though I pride myself as a fairly competent coleopterist, I occasionally run into beetles that—despite my best efforts—I just cannot identify them beyond the family level. I don’t feel too bad about that, as the group’s 350,000 to 400,000 described species represent more than a third of all described life forms! Still, with the amount of information now available online combined with traditional print literature, it’s frustrating when I photograph species that seem quite distinctive but fail to show up in any search result. Here are a couple of South American beetles that I’ve pondered over for a year or more now. If you have any thoughts on their identity I would appreciate hearing from you. Tenebrionidae? | Campinas, São Paulo, Brazil. This first beetle was encountered January 2011 on the trunk of a tree in the city of Campinas, southeastern Brazil (São Paulo State). I only got this one shot of it before it dropped and disappeared, and except for the bright green color of the head and pronotum it reminds me of some of the long-jointed beetles—formerly the family Lagriidae but now a subfamily of Tenebrionidae (darkling beetles). 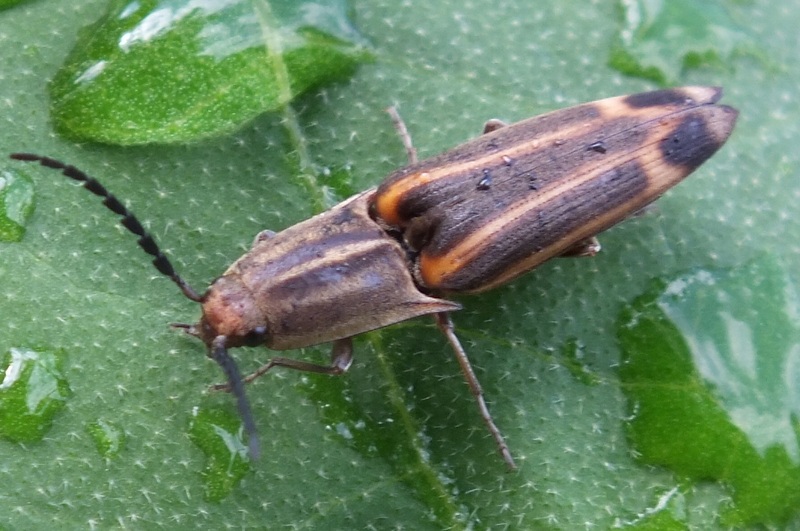 This is without question a species of click beetle (family Elateridae), but despite its rather distinctive coloration I’ve not found any images that resemble it. I found these beetles fairly commonly on flowers of Solidago chilensis in April 2012 at several localities along Rt 16 in northern Argentina (Chaco Province). This entry was posted in Coleoptera, Elateridae and tagged Argentina, beetles, Brazil, click beetles, entomology, insects, science. Bookmark the permalink. The tropics will humble even the greatest of us. I’ll let Sam know to look at the clicker. Ah yes, those lovely tropical Conoderus! Ah, Conoderus – just knowing the genus is good enough for me, thanks! Conoderus, really, based on what? Do the claws really have setae? It could be but without some micro work it is very hard to get this to even a genus. Of all the hundreds of SA clicks I have in my collection I have never seen this particular one. Nice photo. I think I’ve got a few specimens. If they would be of interest to you please let me know. 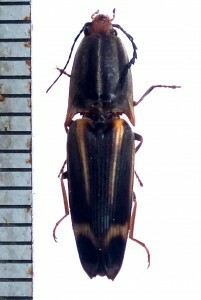 Elateridae, Agrypninae, Oophorini, Conoderus sp. and most probably Conoderus malleatus.